MGM had the great fortune of stepping back in time and playing Wawashkamo Golf Club on Mackinac Island in northern Michigan a few years ago. Golfers have to either bike or take a horse-drawn carriage to get to the historic course that is situated in the middle of the island. We believe that golf aficionados need to experience Wawashkamo at least once in their life. The course name is Indian for “Walk a Crooked Path” which is how they described golf the first time they saw it played! For a complete report on what makes Wawashkamo distinctive, please see below. Wawashkamo Golf Club is a classic design crafted in 1898 by Alex Smith, a two-time U.S Open Champion. A Scotsman by birth, Smith brings a truly Scottish flare to the straights of Mackinac. As unique as the name is, the course pays homage to legendary tracks like St. Andrews, and Troon. With small greens and even smaller tee boxes, Wawashkamo is defined by firm fairways, and thick bronze heather. Either horse or hand shaped the many contours, bumps, and moguls that define Wawashkamo Golf Club. Typical of a links course, Wawashkamo is void of trees except on its outer boundaries. As guests walk onto the first tee they will be looking out not only towards the fairway, but also a battlefield. 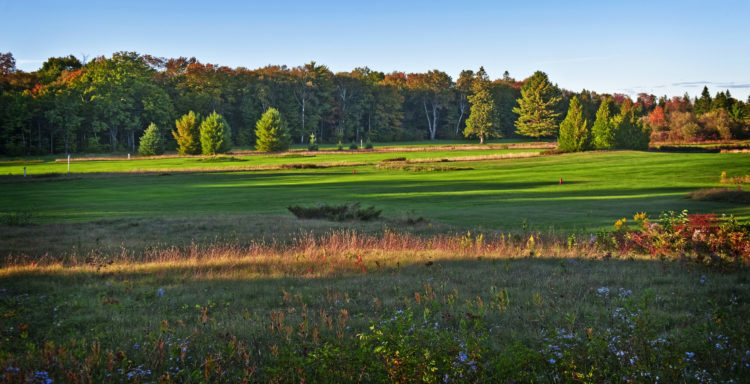 The carefully carved land that Wawashkamo Golf Club sits on was once the scene of a historic battle in The War of 1812. Resting underneath the sixth fairway are twelve brave American soldiers, marked by a plaque of remembrance. The remnants of The War of 1812 are seen throughout the clubhouse and course. Guests can view objects on site found from a recent archaeological dig that vary from early 18th century musket balls, to bronze infantry uniform buttons. As guests complete their round, they look up to the towering American Flag, across the road to the clip-clop of a horse drawn carriage, and realize that this is unlike any other golfing experience. At Wawashkamo Golf Club the fast clip of time is slowed, allowing visitors the chance to breathe in the Island spirit. Wawashkamo Golf Club unlike many courses has not been altered since Smith’s original design. While not intimidating by length on the scorecard, Wawashkamo tests her guests will with demanding precision, and unusual natural hazards. One such hazard known as the “Circus Ring” is a shin high circle of long heather surrounding the 3rd green. These attributes, unique to Wawashkamo are what give visitors a once in a lifetime experience. 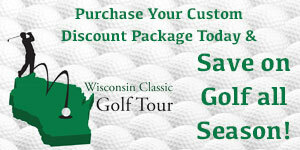 For More Information about Historic Island Golf, special rates and events at Wawashkamo Golf Club visit www.wawashkamo.com or call (906) 847-3871.